.25-06 Remington 100 Grain Nosler Ballistic Tip~ The .25-06 Remington had been a wildcat cartridge for half a century before being standardized by Remington in 1969. It is based on the .30-06 Springfield cartridge necked-down (case opening made narrower) to .257 caliber with no other changes. 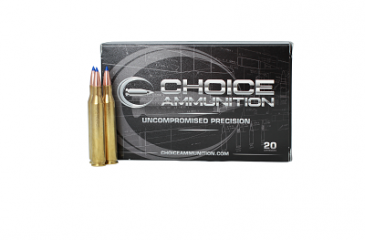 Nominal bullet diameter is 0.257 inches and bullet weights range from 75 to 120 grains. The cartridge has less felt recoil than a 30-06 in a similar weight rifle, due to the lighter weight bullets used. Shooters who are recoil sensitive will find the recoil from the 25-06 bearable, but not pleasant enough to shoot all day long. This cartridge is not quite as powerful as the .257 Weatherby Magnum, usually running 200–300 ft/s (61–91 m/s). slower with a given bullet weight. .25-caliber bullets typically have high ballistic coefficients without being heavy. This characteristic, when combined with the large case capacity of its parent .30-06 case, allows relatively high muzzle velocities without heavy recoil. The combination of high ballistic coefficients with high muzzle velocities give the .25-06 a very flat trajectory as well as retaining kinetic energy down-range. The .25-06 is generally considered to be a good round for medium-sized game such as deer and antelope because of its combination of substantial kinetic energy and moderate recoil. The addition of a flat trajectory makes it particularly popular in plains states where the open fields can require longer-range shots on game, as this flatness tends to minimize range-estimation errors by the hunter. Our 100% Hand-Loaded 100 grain Nosler Ballistic Tip rounds are loaded with extremely tight tolerances, producing highly accurate, consistent and reliable performance with each and every shot! Our proprietary load formulas and loading process create the finest round of ammunition available on the commercial market today we feel. If you don’t load your own ammunition- let us do it for you! Nosler’s Ballistic Tip Bullets are designed for violent expansion upon impact. The bullet is tipped with a polycarbonate tip which rapidly drives back forcing the thin jacket to expand and fragment. The heavy base prevents deformation during firing and the boat-tail design increases the ballistic efficiency of the bullet. .25-06 Remington 115 Berger VLD-Hunting~ The .25-06 Remington had been a wildcat cartridge for half a century before being standardized by Remington in 1969. It is based on the .30-06 Springfield cartridge necked-down (case opening made narrower) to .257 caliber with no other changes. 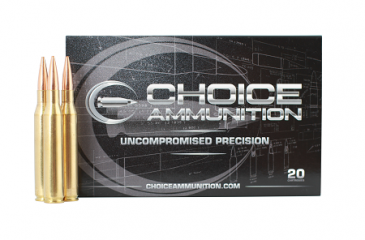 Nominal bullet diameter is 0.257 inches and bullet weights range from 75 to 120 grains. The cartridge has less felt recoil than a 30-06 in a similar weight rifle, due to the lighter weight bullets used. Shooters who are recoil sensitive will find the recoil from the 25-06 bearable, but not pleasant enough to shoot all day long. This cartridge is not quite as powerful as the .257 Weatherby Magnum, usually running 200–300 ft/s (61–91 m/s). slower with a given bullet weight. Our 100% Hand-Loaded 100 grain Berger VLD-Hunting rounds are loaded with extremely tight tolerances, producing highly accurate, consistent and reliable performance with each and every shot! Our proprietary load formulas and loading process create the finest round of ammunition available on the commercial market today we feel. If you don’t load your own ammunition- let us do it for you! The Berger VLD Hunting bullet line features Very Low Drag (VLD) bullets that have the highest possible ballistic coefficient designed for 300 yards or more, the design incorporates a sharp nose that allows the bullet to penetrate 2″ to 3″ before it starts to expand. After the initial expansion, the bullet will shed between 40% and 85% of its weight as shrapnel into the surrounding tissue (internal organs). The combination between the shrapnel and the hydrostatic shock produces a massive wound cavity within the vital area that will be 13″ – 15″ long. This massive wound cavity results in the animal dropping fast since most go into shock after such a tremendous blow. Those animals that don’t go down immediately will soon succumb to blood pressure loss and/or organ failure producing a quick ethical kill. Our 100% Hand-Loaded .25-06 120 grain Nosler Partition rounds are loaded with extremely tight tolerances, producing highly accurate, consistent and reliable performance with each and every shot! Proprietary load formulas and our hand loading techniques offer the finest ammunition on the commercial market today. Nosler’s special lead alloy, dual core provides superior mushrooming performance at virtually all impact velocities. The Partition’s fully tapered copper jacket gradually thickens along the bullet’s axis, controlling the core’s mushroom for controlled, uniform expansion. An integral partition separates the bullet’s two cores, holding two-thirds of the bullet’s original weight in the rear core to fuel a deep penetration every time. Special crimp locks help the bullet resist deformation, even with the heaviest of magnum loads. Each Partition bullet is designed by Nosler engineers to give you the optimum length, weight, and ogive design for each caliber to give you maximum flight and terminal performance. Minimum impact velocity: 1800 fps. There aren’t a lot of true disadvantages to this bullet because it is truly “debugged” technology. Newer bullets are very specialized for certain uses – some are for large game, some are for long range, and some are just for penetration or expansion. The Nosler Partition is more of a “jack of all trades and master of none” at this stage in bullet technology. .25-06 Remington 80 grain Barnes TTSX~ The .25-06 Remington had been a wildcat cartridge for half a century before being standardized by Remington in 1969. It is based on the .30-06 Springfield cartridge necked-down (case opening made narrower) to .257 caliber with no other changes. 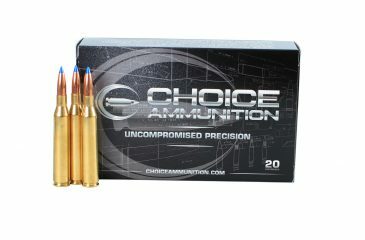 Nominal bullet diameter is 0.257 inches and bullet weights range from 75 to 120 grains. The cartridge has less felt recoil than a 30-06 in a similar weight rifle, due to the lighter weight bullets used. Shooters who are recoil sensitive will find the recoil from the 25-06 bearable, but not pleasant enough to shoot all day long. This cartridge is not quite as powerful as the .257 Weatherby Magnum, usually running 200–300 ft/s (61–91 m/s). slower with a given bullet weight. Our 100% Hand-Loaded Barnes 80 grain TTSX rounds are loaded with extremely tight tolerances, producing highly accurate, consistent and reliable performance with each and every shot! Our proprietary load formulas and loading process create the finest round of ammunition available on the commercial market today we feel. If you don’t load your own ammunition- let us do it for you! Since its introduction in 2003, Barnes’ TSX Bullet has earned a reputation as “the perfect hunting bullet.” Now, Barnes has improved on perfection by adding a streamlined polymer tip. The new Tipped TSX features the same 100-percent copper body with multiple rings cut into the shank. It delivers the same gnat’s-eyelash accuracy and “dead right there” performance—but with an added polymer tip that boosts BC and improves long-range ballistics. The tip and a re-engineered nose cavity provide even faster expansion. Complete penetration, virtually 100-percent weight retention and four razor-sharp cutting petals that double bullet diameter means the new Tipped TSX creates more internal damage than any competing bullet. Instant expansion and perfect penetration ensures cleaner, quicker kills.